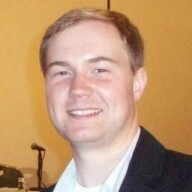 This is a guest blog from contributor Zac Johnson. Email marketing is likely always going to be one of the best mediums for connecting with your audience. Even with all of the transitions and changes that have taken place over the past two decades on the internet, email is still one of the most consistent methods for getting your message to people around the world. This is especially true for marketers, businesses, and brands. As they commonly say in the world of online marketing and business, “the money is in the list”. While this very well may be true, it’s simply not as easy as creating a mailing list, getting subscribers, and then cashing in. Like anything worth doing, this will also take some time and expertise to master. To help with this process, I’m going to highlight five unique and effective ways to improve your email marketing efforts. Many of these methods I still use today for my own personal email, branding and marketing. If it’s working for me, it should also work for you. How many emails are you sending out on a daily basis? Not from your business, but from your actual inbox. Just 50 emails per day (which doesn’t seem like a lot), can quickly add up to more than 18,000 emails being sent per year. With so many emails going in and out of your inbox, are you missing out on a great branding opportunity? This is something I personally thought about, especially when I would see other emails with great signatures and personal information. So I decided to look into this a bit more and set one up for myself. I ended up creating a custom Gmail signature that you can see below. 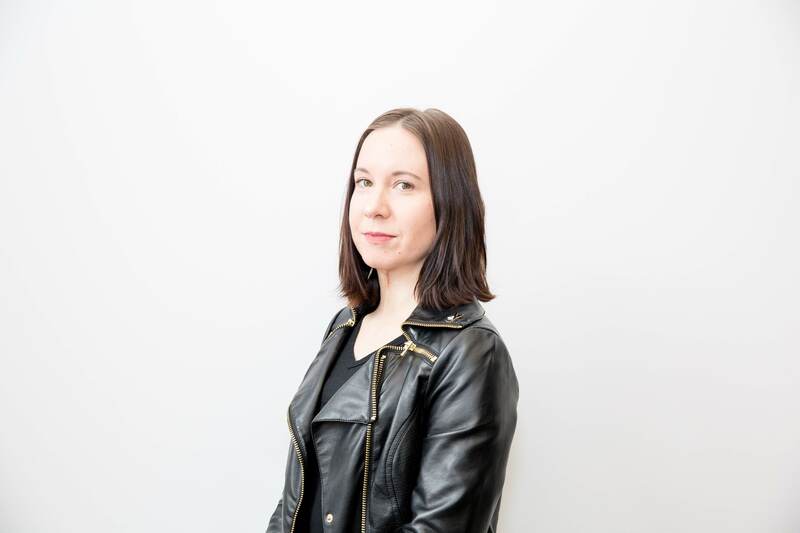 Not only does it make my emails look more professional, it also generates a decent amount of activity for my website, blog, social profiles, and latest content that is featured at the bottom of every email I send. Best of all, this is extremely easy to setup and you never know what type of opportunities might come as a result of it. Email and list hosting providers are great for the easy setup and sending to your mailing list, but if you are simply relying on the options and features they have to offer, you are likely missing out. Retargeting is something that is gaining a lot of attention lately, as it’s an extremely effective way to advertise to your audience after they leave your site — often done through Google Adwords and Facebook Ads. One way to instantly increase conversions and engagement is to place a tracking pixel in your mailing list or in the promotional newsletters you send out. It’s one thing to see open and click rates from your list host, but it’s another to actually be able to target your email openers and possibly sell them one more time after they close that email. 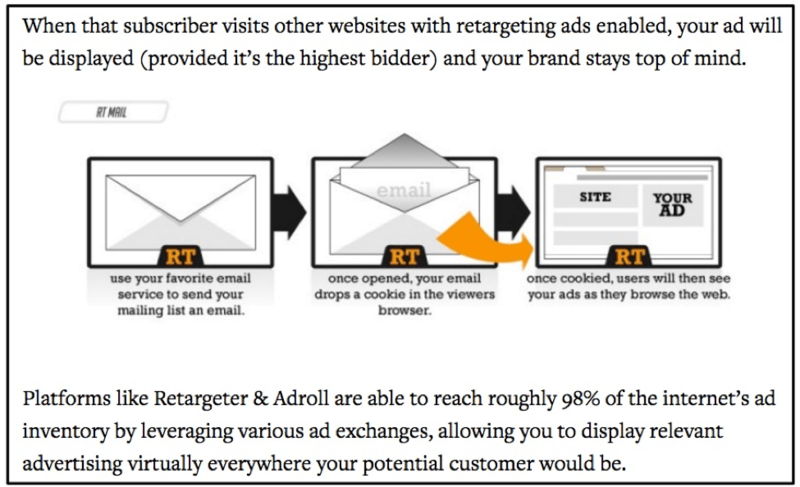 ConversionXL has an excellent write up on the process of setting up retargeting ads in emails, while also providing some great stats and resources as well. 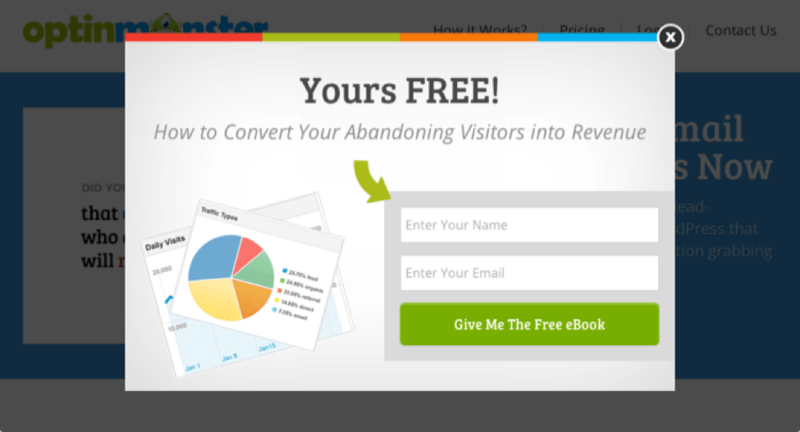 I recommend you take a look at this method and implement it into your existing email campaigns. Even if you aren’t going to start using retargeting within your emails right away, you should be growing a custom audience set for when the time comes. Email marketing is all about providing value and gaining the trust of your audience. For most people, when an email pops into their inbox, they are going to check it right away. If it didn’t provide instant gratification to the end user, it will quickly be deleted or even unsubscribed from. An excellent way to gain the trust and respect of your audience is to send out emails that deserve their attention. If you currently have a brand or business associated with your mailings, then you should be branding your message in that way. A perfect example of how to do this would be to have an email template or design that shows off your company or website logo, while also making it easy for your readers to navigate through your content. 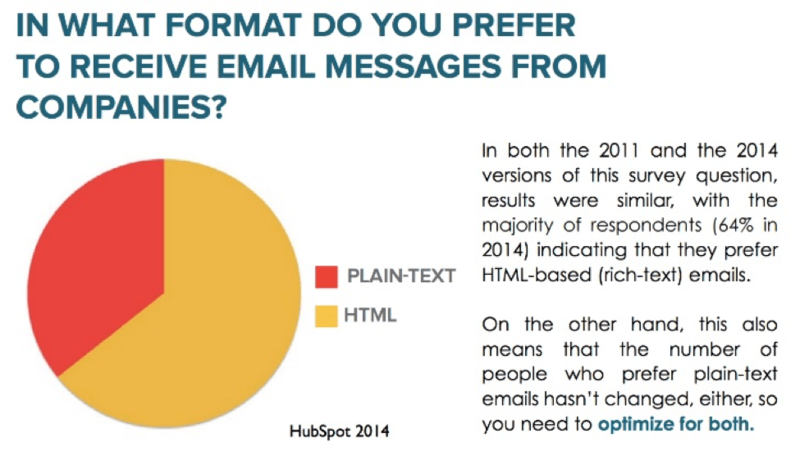 Hubspot even reports that more people prefer to receive emails in HTML format instead of plain text. Depending on what Email Service Provider (ESP) you are using to create and send your emails, this maybe easier than you think. Using a drag and drop email creator, it’s easy to pick a template design and customize it to match the look and feel of your existing brand. Not only will this make your emails look better, it will also make sure they are responsive and look perfect no matter what computer, tablet or mobile device they are being viewed on. One of the hardest things to accomplish is getting your email subscribers to simply click and open that email. Put in the time and effort to make sure what they see is worth their time. An engaging and beautiful email would deliver much better results than a simple text-based email. Grab their attention, get them to click over to your site, and then work your magic to close the deal. The secret to long-term and successful email campaigns are making sure you have an active list with content coming and going at all times. Far too often I come across websites and blogs that actively grow their list, but only send out promotions or emails every few weeks. In some cases this might work but, more often than not, the thrill is gone and your audience has already lost interest in why they might have signed up in the first place. One of the best ways to keep your mailing list active and bringing in new sales and traffic for weeks or months to come is to set up an autoresponder series. To see some examples of how top bloggers are growing their own mailing lists and increasing signup numbers right on their sites, be sure to check out these popup mailing list windows. The first step in having a great mailing list is to offer something of value to your audience in exchange for their email. Through the examples on the site I mentioned, you can see what top sites are offering to rapidly grow their lists. It all starts with this simple free gift, but it’s the follow-up emails and autoresponder that works the real magic. After all, if someone wants your free report or an ebook, they would likely be very interested in other content you have to offer as well. For more on this process, you can follow these helpful email marketing tips from various marketing experts in the industry. In short, create both a pop-up call to action form and an autoresponder series for your mailing list to help your audience gain trust. Don’t try and sell them within the first few mailings; Instead, build a relationship on value, then offer some up-sell or purchase options a few mailings down the road. At the end of the day, the biggest deciding factor on whether or not someone is going to open your email is the headline. No matter how great the offer or content inside your email, if you don’t have a title that grabs interest and begs to be opened, it will likely end up in the trash or simply never read. When it comes to email headlines, you also need to be careful not to trick, annoy or anger your subscribers in the process. Make sure your title makes sense and provides value, but also has a sense of urgency. Instead of going crazy trying to come up with a killer headline for your next email, you can simply look at what has worked for others and come up with something similar. 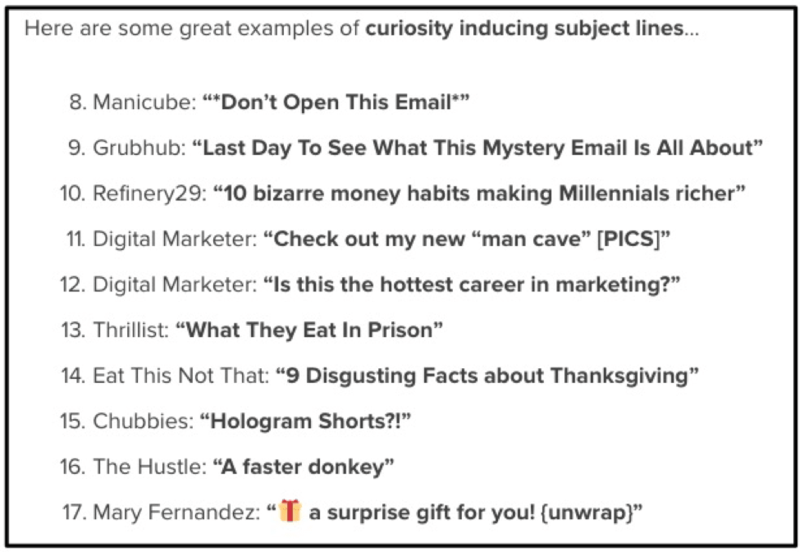 OptinMonster has an amazing resource guide that offers 164 email headlines that make subscribers want to click open. You can see a few of their best curiosity-inducing headlines below. In addition to the headlines being used with emails, you should also consider the words inside each mailing, too. For example, are you leaving your audience with a dead email that offers them nowhere to go except to close the email and move on? Or do you have a nice call-to-action where they can click over to your site to read the rest of your content or act upon your latest offer? No matter if you are focusing on your headlines or the call-to-actions within your content, be sure to A/B test your ad copy and content at all times. This is usually quite simple to set up in any list hosting solution. Test and compare results with small subsets of your list, then send out the big winners to the majority of your list. Whether you want to step up your email marketing game for your brand or business, or even just for personal use, there are plenty of ways to get started today. Be sure to run through the list above and see which might be best for your business. At the very least, I highly recommend setting up an email signature to better brand yourself and look more professional in the process. Also, if you are doing any type of sales or branding within your emails, don’t forget about the importance of A/B testing and coming up with a great headline for your emails. Start implementing these email marketing tips today to make 2017 your best year ever! Grab a custom email of your own and instantly look more professional. Get yours free for the first 3 months at Rebel. 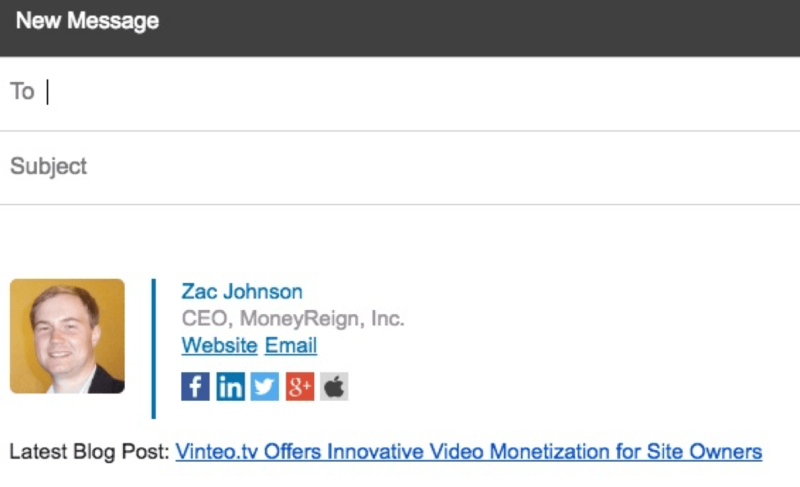 Zac is the CEO & President of MoneyReign, Inc.